This time it would be Gabe E and I carpooling to the start. Jim G was sick and had to cancel on the fun this time. I consider this event an fun easy ride, riders tend to stick together for most of the route and the few hills that we encounter are gentle. Since I had cut down on my cycling since the 600k a month ago I thought it would be a good idea to go for a run on Saturday morning, something easy like the Presidio loop we often do with the wife which is just over 5 miles. Well it all was fine until we started running downhill on some trails, I got a real acute pain in the quads and almost had to stop. By the time we were back home I wanted to take a nap and just rest, so I did. After preparing my gear, another short nap and then I was hungry, a Mexican style Cuban torta from the nearby taqueria hit the spot. I was ready to go pick up Gabe. We were very early to the start, something unusual for me but a welcome change. Had time to chat with all suspects and then at 8:00pm sharp we were off into an ~80 degree evening, lovely. The whole group of 30-some riders rode together most of the way to the Carquinez Bridge and then the little rollers before Lake Herman did their thing and split us up. We were now nature-sorted into similarly paced riders. The group that I end up in was the head one, I was very familiar with all the riders except one, Brian K. Two San Francisco Randonneurs RBAs Rob H. our current RBA, Todd T our previous RBA, Willy N, Gabe E, Brian C and Ken J the other SFR, who like me, has been riding flat bar bikes on brevets for a while. When we were getting ready to leave the first Control the second group of riders arrived and soon after them a larger third group, I think all riders were now there. Same thing happened at the second control at the 7-11 in Vacaville. All these miles are flat and if done alone can be very tedious work. Fortunately, I think all riders were sharing the slight head wind. 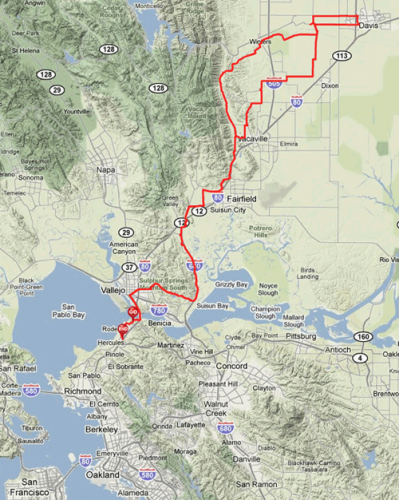 A section on the Vacaville to Davis segment has to be one of the most boring cycling around, but the darkness made things different and interesting sending a stray raccoon or jack rabbit across the road at the worst time. Finally, Davis! As is sometimes the case, a Safeway cashier would ask what the heck a bunch of sweaty people wearing helmets are doing buying $2-10 worth of food and drinks at weird hours of the night? "yes we are riding from A to B" , "oh no we are not crazy, it is lots of fun!". Once we were out getting ready to leave the other two groups of riders showed up. I have never seen a brevet were there was such little time difference between groups for 70 miles. However, the second half of the ride would separate our groups. We started the same way we arrived in Davis, some conversation and some riding. By the time we were close to Lake Solano the pace was getting a little faster. Once we passed the Lake area the group split into two. Gabe, Brian C. and Willy stayed behind. Brian K chased after Ken and I followed, then Todd and Rob joined us. After a long pull Ken slowed down right before we passed in front of a property with some wild barking running dogs. We all passed by before the dogs could get a taste of our bodies or bikes, but Ken almost became dog dinner. The excitement kept us more vigilant for a while. The roller before Lake Herman again spread our group. Brian K was way ahead and waited for us at the top of the hill, then we all together rode the semi-urban miles to the last control. More rollers and then Ken slowed some more, now it was just the four of us. We saw Vallejo and the Carquinez Bridge, before I knew it we were at the end of the ride. A few minutes afterwards Ken arrived and then about 30 minutes later Gabe, Brian C and Willy. We stayed there chatting with Alex P who was volunteering and then as Christian F. arrived for his volunteer shift Gabe and I packed up our stuff and headed home in the car.